Concrete installation looks easy enough, but when it comes to your investment, trust an experienced concrete contractor to do the job right. Did you know there are eight critical steps your contractor should follow? Follow along as we review the complete eight step process for concrete installation. One important thing to remember: before your concrete gets poured, be sure you’re familiar with the six steps your concrete contractor should be doing prior to paving. Once those steps are completed, it’s time to start laying your concrete! Typically, once the paving work is scheduled, you will be notified with an estimated start date then called a day before the work begins. An estimator will visit your property to ensure the conditions are ideal for paving and give you a detailed quote. Concrete will last longer if it’s built on solid, level, and well-drained soil. If extra work is needed to prepare your property the sub-base, your contractor will let you know at this time. When the paving crew arrives, it takes some time to prepare the machinery for paving. During this period, the crew will go over the gravel base to double check that it’s ready for paving. The team will then build up forms in the shape the concrete will take, now the concrete can be poured. The paving crew will then level the concrete in a process called “screeding.” Screeding is when a flat board and other screeding tools are used to smooth concrete after its been laid to assist with flattening. Concrete begins to set very quickly and the process of smoothing your pavement is ongoing. Crew members will use power and hand tools to smooth and even the surface. 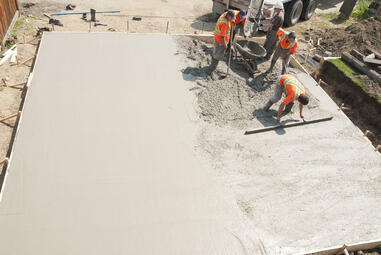 After the concrete is installed, crew members will apply a cure agent to the surface. This slows the water loss over a 30-day period, leaving you with stronger, nicer-looking concrete. Your new concrete surface will take 7-10 days to cure before it can be used. While concrete sets fairly quickly, it remains weak until fully cured. As a result, it’s important to keep people, pets and traffic off the surface for several hours. Any premature surface traffic can leave permanent marks. After the initial set, workers will remove the forms and clean up. 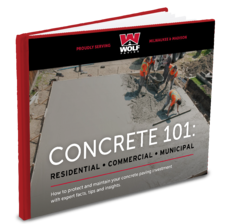 If you need a quick concrete overview visit our Concrete Paving FAQ page. At Wolf Paving, we value an honest relationship with our customers and work hard to keep you informed before, during, and after project work. If you have questions about any part of the paving process or would like to get a free estimate, please contact one of our paving specialists. It’s never too early or too late to request a free paving estimate. Feel free to contact us with questions. For the Milwaukee area, call us at 262-965-2121. For the Madison area, call us at 608-249-7931. With over 75 years of paving experience, from highways to driveways, we are your local source for all of your paving needs. Wolf Paving’s concrete contractors offers services from Milwaukee to Madison, and everywhere in between, including all areas around: Sun Prairie, Oconomowoc and Waukesha.